Case: Joyce in the States was trying to research 2 of her husband's Danish ancestors, Ole Sørensen and his wife, Bertha Hein. She had already pursued a number of lines of inquiry without success. 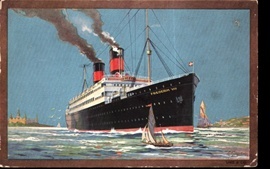 The information at hand was the birth dates of Ole Sørensen and Bertha Hein – plus some old postcards from Bertha’s family in Denmark to the family in the States. It was a challenging task to locate Ole and Bertha in Denmark – Bertha being the easiest because of her last name. To identify Ole took much more research and hard work but finally it was possible to prove his identity and shed light on both his and Bertha’s family background in Denmark. Joyce recommends Per Andersen: "FANATASTIC!!! Thanks for all your hard work - I'm sure our family will be excited to learn so much that was hidden for so long. I really appreciate the thoughtful way you've gone about this search." Case: Anny knew that Anna Kristine, a sister to her grandmother, had emigrated from Denmark to USA around 1913, and she had a couple of letters from Anna Kristine from the States during the following years. But then Anny did not know what had happened to her. Did she have descendants in USA today? Unfortunately, the research showed that although she had married a Swedish man on October 5, 1918, she died already in May 1919 of tuberculosis in New Hampshire. She only reached 22 years. 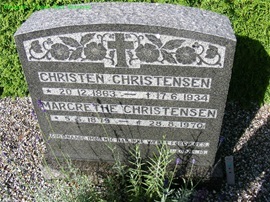 Anny recommends Per Andersen: "For many years I have wondered what happened to the sister of my grandmother in the USA. It is wonderful to have this resolved – and Per solved the task quickly and efficiency with many good details and copies of documents." US-based Emily recommends: “I cannot recommend Per Andersen strongly enough. He is, quite simply, a genealogical detective of the highest degree. My original goal in contacting Per was to solve a family mystery that is 113 years old. Quite simply, I wanted to know as much as possible about the identity of my maternal grandmother's father. 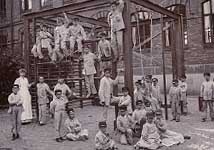 My grandmother, born out of wedlock in Denmark in 1890, grew up primarily in an orphanage in Jaegerspris. No one, not my grandmother who emigrated to America as a young woman, or her two daughters, ever made headway with their research. Enter Per Andersen. Within days, he had cracked the code and solved the mystery, providing me with a wealth of information about the elusive Hans Madsen, the man in question. My mother, aged 84, thought she would go to her grave without ever seeing her mother's birth record or knowing anything about her grandfather. Thanks to Per, I was able to present this information, and much more, to her on Mother's Day. The next time I am stumped about something in the history of my Danish ancestors, I will once again turn to Per." Case: Christian did not have any contact to his cousins since the 1950s. At the same time he believed that his father was half-brother to the only sibling he had, a sister with whom there had been no contact for many years. Christian had himself tried to find his cousins for many years without luck. The reality also turned out to be quite different from what he had imagined. Christian’s father and the sister turned out to have the same parents, which was new information. We also managed to find the two cousins, of which, unfortunately, only the one was still alive. Christian recommends: "Many, many thanks for the immense work you have carried out. It is fantastic that you have found the truth about my family and located my cousin who I am now regularly in contact with. I would very much like to recommend you to others”. Case: As a young girl Hulda, the grandmother of Gunner, immigrated to Denmark from Sweden, where she had been raised in foster care without any relations to her parents. The rumours in the family were that Hulda was the child of a sea captain and a distinguished, unmarried lady. The mother did not want the child and therefore the captain immediately paid a large sum of money for the child to be raised in an orphanage and in foster care until she was a young woman. Extensive research in Sweden revealed the reality of Hulda’s family. It turned out that Hulda was the illegitimate child of an unmarried, poor mother, who herself was an illegitimate child. Hulda’s mother had became pregnant with a shoemaker, but when the child was to be born, the shoemaker was accused of stealing tools from the widow he worked for. Hulda’s father was sentenced to 6 months of labour work. After Hulda was born, the mother became ill and was not able to feed the child. So the authorities decided to take Hulda away from her mother and place her in an orphanage. 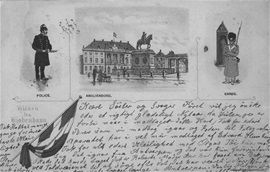 The research revealed the case file from the orphanage in Stockholm, Sweden, as well as other documents such as the court sentence over Hulda's father. Case: A rumour had circulated in Kaj’s family for a long time. The great grandfather was said to be the child of a Count Danneskjold-Samsøe from Gisselfeld. He was raised in foster care and the names of his parents were sealed when he was born in the birth hospital in Copenhagen in 1817. 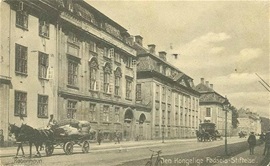 The foster family lived about 15 km from Gisselfeld in Herlufmagle, and as an adult the great grandfather worked as a postman on the Gisselfeld estate. Based on a wide range of sources it was researched whether any connections could be found between Kaj’s great grandfather and Gisselfeld. A number of documents, testaments and financial transactions were researched and the social network of the great grandfather was mapped. 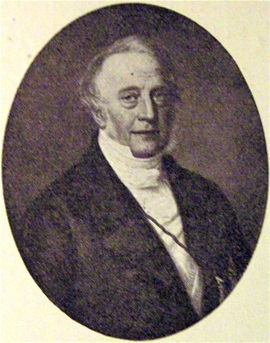 No evidence was found that the great grandfather was a son of Count Frederik Christian Danneskjold-Samsøe. Following the research, Kaj published to his family an extensive document where this research was the central part.